Following a jury verdict of willful induced infringement of plaintiffs' congestive heart failure treatment patent and damages of $235 million, the court granted defendant's renewed motion for judgment of noninfringement as a matter of law because substantial evidence did not support the jury's finding that defendant induced doctors to infringe. "⁠[Plaintiffs] failed to prove by a preponderance of the evidence that '⁠[defendant's] alleged inducement, as opposed to other factors, actually caused the physicians [i.e., as a class or even at least one of them] to directly infringe,' by prescribing generic carvedilol and to do so for the treatment of mild to severe CHF. Without proof of causation, which is an essential element of [plaintiffs'] action, a finding of inducement cannot stand. . . . [Defendant's] uncontroverted evidence of alternative factors that caused physicians to prescribe carvedilol in an infringing manner cannot be ignored. . . . [G]iven the dearth of evidence that doctors read and understand and are affected by labels, and given the vast amount of evidence that doctors' decisions to prescribe carvedilol during the relevant periods were influenced by multiple non-[defendant] factors -- such an inference was an unreasonable one for the jury to have drawn." Following plaintiff's voluntary dismissal, the court denied defendant's motion for attorney fees under 35 U.S.C. § 285 because plaintiff's litigation positions were not unreasonable. "Defendant argues that [plaintiff's infringement analysis] was insufficient and that the Federal Circuit’s holding in Judin v. U.S., 110 F.3d 780, 784 (Fed. Cir. 1997) required Plaintiff to purchase a product sample prior to filing suit. . . . ⁠[O]btaining a sample of the infringing product is not a bright-line requirement to filing a patent infringement claim. . . . Plaintiff conducted an infringement analysis which included an informed comparison of the claims of the [patent-in-suit] against the publicly available information regarding the [accused product]. Under the Federal Circuit case law, this is sufficient to constitute an adequate pre-filing investigation." The court granted defendants' alternative motion to transfer for improper venue because defendants did not have a regular and established place of business in the district. "The full extent of Defendants’ physical presence in the [district] is a shelf containing a piece of [one defendant's] telecommunications equipment. . . . [T]his equipment is involved in processing calls to and from New York-based phone numbers. . . . All electronic traffic flowing to [defendant's] equipment travels via [plaintiff's] network. . . . In a sense, the preposition is key: [defendant's] employees may direct telecommunications traffic through New York, but they do not engage in business from the shelf itself. . . . The Court acknowledges that a human-centered definition of 'place of business' may feel unsatisfying in an economy increasingly characterized by virtual transactions. But the Court is constrained to follow the text of the statute, which 'cannot be read to refer merely to a virtual space or to electronic communications from one person to another.'. . . Under a faithful reading of the statute, the Court must conclude that whatever a 'place of business' is, it is not a shelf." Following plaintiff's post-Markman stipulation of dismissal and a bench trial finding inequitable conduct, the court granted defendant's motion for attorney fees under 35 U.S.C. § 285 because plaintiff's severed litigation misconduct was exceptional. "While the finding of inequitable conduct alone warrants an award of attorney fees to [defendant], the Court need not rely on that ground, as [plaintiff's] conduct during litigation is surely enough. . . . [Plaintiff] specifically withheld: (1) non-privileged documents; (2) previously privileged documents as to which [plaintiff] affirmatively waived the privilege and which this Court ordered be produced . . . ; and (3) documents on the privilege log relating to precisely those topics waived [plaintiff] . . . when it filed its trial declarations. This misconduct began soon after the case was filed and continued until the Court finally conducted an in camera review of [plaintiff's] privilege log on the eve of trial. Only then, when it was too late to reopen discovery, did the Court discover the massive amount of information withheld from it (and from [defendant]) over the preceding year. Indeed, the extent of [plaintiff's] mischief was so vast that the Court noted it could not delay trial and require production of the documents to [defendant] without appointing a special master to oversee [plaintiff's] production -- to do so would likely be futile." The court granted plaintiff's motion for a preliminary injunction requiring defendants to withdraw their petitions to the PTAB seeking to invalidate plaintiff's patents-in-suit because plaintiff established a likelihood of success on the merits of its related breach of contract claim. "Both Plaintiff and Defendants have raised the issue of validity and enforceability with this Court through their complaint and counterclaim, and validity and enforceability are the same issues that [defendant] has placed before the PTAB. But for the parties’ licensor-licensee relationship, and Defendants’ interest in reducing or eliminating the royalties provided for under the [parties' license agreement] based on the claim of invalidity, there is no indication that [defendant] would be pursuing the PTAB proceedings at all. . . . Defendants essentially ask this Court to permit their belated attempt at forum shopping. District courts are authorized to decide patent validity challenges and Defendants’ preference for one forum over the other does not justify the PTAB Petitions if they are not, in fact, permitted under the [agreement] and that provision of the [agreement] is lawful." The court granted in part plaintiffs' motion for monetary sanctions after defendant disclosed corrected stability dissolution testing data during a bench trial and directed that the FDA be informed of defendant's conduct. "The conduct of [defendant] and [its drug manufacturer] reflects an appalling lack of awareness of a litigant’s responsibility to our justice system -- in [defendant's 30(b)(6) witness's] case conduct laced with mendacity as well. It is worth remembering that [the witnesses at issue] are not bit players here. [One] is the owner of [the manufacturer]. Both he and [defendant's 30(b)(6) witness] are members of [the manufacturer's] management team. . . . The FDA would be well advised to take notice of this pervasive corporate unwillingness to play by the rules. The Clerk is therefore directed to send a certified copy of this opinion to the General Counsel of the FDA. Sanctions are amply warranted here." The court sua sponte stayed plaintiff's patent infringement action pending ex parte reexamination to conserve judicial resources. "⁠[H]appening essentially in real time, there are accusations of perjury being submitted to the PTO based on declarations and arguments before this Court, and there are arguments of inequitable conduct being submitted to this Court based on accusations of perjury before the PTO. The questionable and challenging interplay between these two proceedings has become unworkable. Continuing in this tandem fashion will only ensure that even more judicial and agency resources are wasted. . . . It’s become apparent that there’s no chance of the parties engaging each other in a civilized manner until the PTO has concluded its reexamination and the parties are done muddying the waters between the two proceedings." Following a jury verdict of $75 million, the court granted defendant's motion for new damages trial because the application of plaintiff's survey expert's results by plaintiff's damages expert was unreliable. 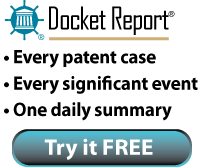 "⁠[Plaintiff's damages expert] directly translated the roughly 28% of survey respondents who allegedly would not have bought [defendant's] phone without the infringing feature to [defendant's] profit in an effort to determine the potential 'at-risk' profit. . . . [The expert] did not consider the numerous patented features on the accused phones, many of which a consumer would consider essential, assuming [another expert's] survey results were extrapolated. . . . [He] did not account for how his theory would result in the erosion of all of [defendant's] profit. Realistically, there are many features on a phone that would likely yield survey results similar to those obtained for the [patent-in-suit], e.g., ability to make a call, text messaging, Wi-Fi connection. To conclude that any one of these features -- simply because it is considered essential to a consumer -- could account for as much as a quarter of [defendant's] total profit is unreliable and does not consider the facts of the case, particularly the nature of smartphones and the number of patents that cover smartphone features." The court denied plaintiff's motion to compel the production of a clawed back deposition exhibit and found the document was privileged. "⁠[Senior in-house counsel] confirmed that [the exhibit] is consistent with the format required for submission of an invention disclosure to [defendant's Patent Review Committee] through the Portal. . . . Although [the exhibit] does not expressly state that it is a request for legal advice, the request is implied. . . . The fact that attorneys on the PRC required engineers or technical experts to assist them in evaluating the invention for purposes of determining whether to pursue a patent does not disqualify [the exhibit] from being covered by the attorney client privilege. . . . [Counsel's] declaration describes PRC’s function as making 'individual patenting decisions on specific intentions that have been submitted to the PRC.' The PRC attorneys 'assess whether the invention was novel and patentable.'" The court granted counterclaim defendants' motion to dismiss for improper venue because defendants lacked a regular and established place of business in the district and ancillary venue did not apply. "Even assuming that [defendants] have committed acts of infringement in the Northern District of Illinois, venue would still be improper because neither maintains a 'regular and established place of business' in the District. [One defendant] has no offices or property in the District, and no phone number or mailing address here. [The other defendant] likewise does not have a regular and established place of business in the District. . . . [Counterclaimant] cites no authority for the proposition that the doctrine of ancillary venue (whatever that really is) can override the clear terms of the patent venue statute. And [TC Heartland LLC v. Kraft Foods Group Brands LLC, 137 S. Ct. 1514 (2017)] puts the nail in the coffin: if the general federal venue statute does not supplement the patent venue statute, then it is unclear why a nonstatutory doctrine could do so." The court awarded defendant its attorney fees under 35 U.S.C. § 285 and rejected plaintiff's argument that defendant was not entitled to attorney fees prior to claim construction. "The Federal Circuit stated that '⁠[plaintiff's] suit became baseless after the district court’s Markman order.'. . . However, as the Federal Circuit identified, this was not the extent of [plaintiff's] misconduct. [Plaintiff] also 'litigated the case in an "unreasonable manner."'. . . [T]his Court, in an exercise of its discretion and as guided by the Circuit’s opinion and directive, finds that it is appropriate in this exceptional case to award [defendant] the fees it incurred from the time of filing through dismissal." The ALJ denied respondents' motion to certify for judicial enforcement its prior art subpoena to two nonparties whom complainants sued for infringement of the same patents in district court because the documents sought were protected attorney work product. "⁠[Nonparty] represents in its opposition that the prior art at issue 'was developed by [its] counsel because of' the district court litigation. [Respondent] speculates that [nonparty] may have also identified prior art 'outside the contours' of the district court case. [Respondent's] speculation, however, is groundless. . . . Such a compilation of prior art is protected under the work-product doctrine, even if the references themselves are publicly available. . . . [P]rotecting the mental impressions and thought processes of an attorney from disclosure is not the only interest protected by the work-product doctrine. The work-product doctrine also seeks to prevent attorneys from relying 'on wits borrowed from the adversary' instead of relying on their own efforts and professional judgment." The court overruled plaintiff's objections to the magistrate judge's order partially striking the report of plaintiff's damages expert. "⁠[Plaintiff] contends . . . all of the information [the expert] relied upon in forming his market share apportionment opinion was made known to [defendant] during fact discovery. To the extent [defendant] needed additional third-party discovery, [plaintiff] alleges it is [defendant's] fault for not seeking it earlier. The Court disagrees. Even if all the information [the expert] relied upon in forming his opinion was made known to [defendant], the market share apportionment theory itself was never disclosed prior to [his] report. Instead, [plaintiff] maintained only its two-player/product market theory, a theory that (at least in part) contradicts the newly-asserted market apportionment theory. That [defendant's] own discovery may have shown that the market was not a two-party/product market is not the issue." Following a $30 million jury verdict and defendant's filing for bankruptcy, the court granted plaintiff's motion to amend its complaint to add defendant's co-owners as defendants along with alter ego and veil-piercing claims. "⁠[Plaintiff] explains that it learned of [defendant's] and the [defendant's owners'] alleged efforts to avoid liability only when it reviewed the bankruptcy filings.⁠ . . . [Defendant] counters that [plaintiff] was 'on clear notice before trial of the substantial risk that [defendant] would be unable to pay the enormous sums [plaintiff] was seeking. Had it wanted to hedge its bets by asserting claims against other entities, it should have sought leave to do so long before now.' But that argument entirely misses the point. Veil-piercing and alter-ego claims are not mere contingency plans for uncollectable defendants. They are specific theories of liability which, absent plausible grounds, would be frivolous to plead. [Plaintiff] argues that the alleged abuse of the corporate form -- the necessary fact that underlies veil-piercing and alter-ego claims -- only came to light later on. The Court certainly will not punish [plaintiff] for failing to assert a claim prior to having the evidence to back it up." The court denied plaintiff's motion for summary judgment that the redesigned version of defendant's adjudicated product infringed its network security patents because there were genuine disputes of material fact which precluded a finding of collateral estoppel. "⁠Apple argues that issue preclusion is inapplicable here, as the redesigned product differs in design and operation from the product at issue in the [earlier lawsuit]. . . . Particularly, Apple notes that the accept message from the FaceTime servers to the caller device was changed between the first version of FaceTime and the redesigned FaceTime. Apple suggests this change to FaceTime was so significant that the servers can no longer meet the 'indication' requirement of the claims. . . . [T]he accused devices in this case are not essentially the same as the devices at issue in the [prior] case. [Defendant] has raised a question of material fact as to whether the redesigned version of [the adjudicated product] infringes the claims of the asserted patents. The parties’ arguments stem from a fundamental factual dispute with respect to the design and operation of the redesigned product, which the Court declines to resolve at summary judgment. Whether, after the changes to the accept message, the [accused] servers fall within the scope of the court’s claim construction is a question of fact for the jury to resolve at trial." The court overruled defendant's objection to the magistrate judge's recommendation to deny its motion to transfer for improper venue because defendant had a regular and established place of business in the district through its office that closed a few weeks before plaintiff filed suit. "Abiding by the Federal Circuit's admonition that '⁠[i]n deciding whether a defendant has a regular and established place of business in a district, no precise rule has been laid down and each case depends on its own facts,' the undersigned finds that the fact that [plaintiff] filed suit in this District within weeks after [defendant] closed its doors is reasonable. Finding that [defendant's] established and regular business in the District weeks before suit was filed is sufficient for establishing venue pursuant to Section 1400(b) does not offend Section 1400(b)'s purpose 'to eliminate the "abuses engendered" by previous venue provisions allowing such suits to be brought in any district in which the defendant could be served.'" The magistrate judge recommended granting defendants' motion for summary judgment of improper venue because there were no infringing acts in the district inasmuch as the accused activities fell under the safe harbor provision of 35 U.S.C. § 271(e)(1). "Plaintiff has not alleged any facts showing activities in this District other than those statutorily exempted from infringement by § 271(e)(1). . . . [T]he relevant question here is not whether Defendants engaged in uses outside the District that are not 'solely' or 'reasonably related' to seeking FDA approval, but rather, whether Defendants have engaged in any such uses in this District so that venue is proper. . . . [A]ll acts of infringement in the Eastern District of Texas are solely clinical, and therefore, the § 271(e)(1) safe harbor applies despite purported nonexempt activity in Minnesota." The court granted in part plaintiff's motion in limine to preclude expert testimony premised on a revised construction of the claim term in question. "⁠[T]he court [previously] construed the claim term 'intumescent' to describe 'a substance that swells and chars upon exposure to heat or flame.' . . . [O]ver three years after the claim construction . . . [defendant] seeks to offer evidence from one of ordinary skill in the art that infringement of the claim term 'intumescent' requires proof that the coating 'swells to a sufficient degree to act as a thermal barrier to lessen the effects of heat or flame on the underlying fabric.' . . . [T]he court declines to further define the term 'swell.' . . . [Defendant] should be permitted to present evidence by an expert as to whether he observes any swelling . . . and criticisms of [plaintiff's] expert’s findings. . . . [H]e may not testify as to any opinion that the results reportedly observed by [plaintiff's expert] fail to indicate swelling 'to a sufficient degree to act as a thermal barrier to lessen the effects of heat or flame on the underlying fabric' because he has conducted no testing to support such a statement." The court granted defendant's motion to stay pending its requests for ex parte reexamination and rejected plaintiff's argument that defendant was engaging in gamesmanship by not seeking inter partes review. "⁠[Plaintiff] argues that [defendant] only made this choice because it wanted to delay this litigation as much as possible, as evidenced by the longer timeline for completion of ex parte reexamination and the fact that reexamination does not have the same estoppel effect as IPR. . . . [I]t was reasonable for [defendant] to choose not to pursue IPR given that the constitutionality of the procedure is currently being considered by the United States Supreme Court. . . . Moreover . . . choosing ex parte reexamination makes economic sense because IPR filing fees alone would cost $50,000 more than reexamination." The court denied plaintiff's motion in limine to exclude evidence of obviousness because CBM estoppel did not apply to an entire statutory basis. "Plaintiff argues that, because [defendant's] CBM challenge was based on 35 U.S.C. § 103, Defendants are estopped from arguing invalidity under that statutory provision. Plaintiff thus asserts that 'ground' in the estoppel provision encompasses the statutory basis for an invalidity challenge to the patent. . . . The estoppel provision applying to CBM review is a fairly new legal rule, and case law does not clearly define its scope. But the Court can gain guidance from the Federal Circuit’s discussion of the term 'grounds' in the context of post-grant review before the PTAB. In [Shaw Industries Group, Inc. v. Automated Creel Systems, Inc., 817 F.3d 1293 (Fed. Cir. 2016)], the Federal Circuit described several different 'grounds' for obviousness that constituted varied combinations of prior art. . . . [T]he Court agrees with Defendants that the word 'ground' in the CBM estoppel provision refers to a discrete claim of invalidity based upon a prior art or a combination of prior art." The court granted defendant's motion to dismiss because the asserted claims of plaintiff’s digital advertising distribution patents encompassed unpatentable subject matter and found that the claims were directed toward an abstract idea. "⁠[Plaintiff] argues that its patents constitute a 'paradigm shift, causing ad systems to behave in an unconventional manner' by providing for real-time insertion of advertisements, selected on attributes or other criteria, instead of 'preinserted' ads that result in all consumers viewing the same advertising content. . . . [T]he claims of the three patents are directed to an ineligible abstract idea: specifically, custom advertising based upon consumer qualities or other data. . . . The different patents and claims envision different arrangements of generic computers to implement this concept in different ways. But, at bottom, they do not represent or describe improvements in computing systems, specific new software or hardware or technology, or some other type of computing method that improves the computer's functionality or makes it more efficient, such as an information 'structure designed to improve the way a computer stores and retrieves data in memory.'" The court granted defendant's motion to strike portions of the report of plaintiff's infringement expert regarding previously undisclosed secondary considerations of nonobviousness. "⁠[Plaintiff] argues that [defendant's] interrogatory was premature because it asked for expert opinion, but [plaintiff] was at least obligated to provide the factual basis for any secondary considerations, and include this factual basis in the interrogatory response itself. . . . The important point, in the Court’s view, is that [plaintiff] not only failed to disclose the factual basis for any secondary considerations, but failed to even disclose any reliance on secondary considerations at all. The prosecution history includes a discussion of secondary considerations . . . yet even this basis for secondary considerations was not included in [plaintiff's] interrogatory response. . . . Although secondary considerations may be important, the prejudice to [defendant] is significant, particularly because [plaintiff] did not disclose the facts it already had knowledge of upon which it would rely." The court granted defendant's motion for summary judgment of invalidity because the asserted claims of plaintiff’s vibration attenuating patent encompassed unpatentable subject matter and found that the claims were directed to a law of nature. "There is no dispute that adjusting the mass and stiffness of the liner will change the amount of damping of a certain frequency. The claimed methods are applications of Hooke's law with the result of friction damping. . . . [T]he Asserted Claims do not disclose a method of manufacturing a propshaft; instead, considered as a whole, they are directed to the mere application of Hooke's law, and they fail to instruct how to design the tuned liners or manufacture the driveline system to attenuate vibrations."